Not all Roman helmets were grand visions of opulence and decoration. The average trooper and soldier wore what he was given or what he could afford that was most protective, and in some cases, that would up being a helmet like this Intercisa Helmet. What this helmet might lack in grand design, though, it more than makes up for it with its effective and rugged design. 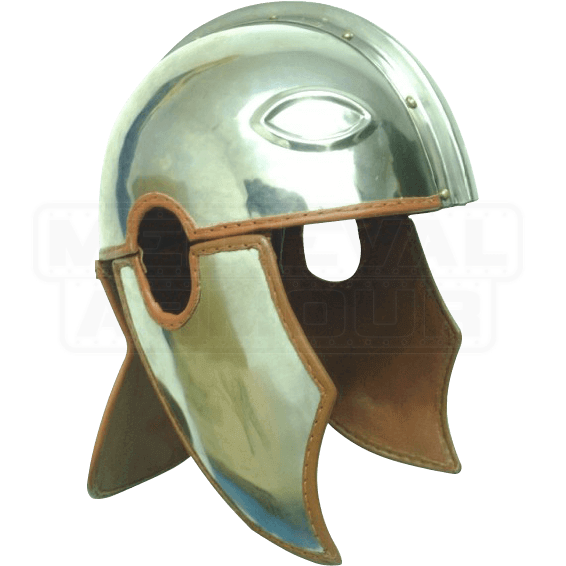 This helmet features a rounded cap that is perfect for deflecting blows, as well as side flaps on each side that help to keep the sides of the soldiers head protected. Holes in the helmets sides also enable the soldier to retain more of his hearing, while the sloped back grants a modicum of protection to the wearers neck. This helmet is made from quality metals and features a simple polished metal finish that enhances the overall look of the helm. It may not be the prettiest of Roman helmets ever worn, but this Intercisa Helmet is definitely just as protective as the others, and when it comes to a soldier wearing it, that is really all that matters.